Food service businesses of all types have been using plastic containers with lids for decades. The containers come in a wide variety of shapes and sizes and are used as: take out food clamshells, deli containers, water and soda bottles, coffee cups, personal care bottles (e.g., shampoo or body wash bottles), and a great number of food items lining the shelves of grocery stores (e.g., milk cartons, food trays for produce, yogurt cups). Traditionally, these items have been made from petroleum, but increasingly a new generation of containers and lids are available that are made from renewable resources including polylactic acid (corn), bagasse, paper, and wheat straw. These materials can be used to make food containers and lids that are certified 100% compostable according to ASTM D-6400 and D-6868, and can thus be composted in a commercial composting facility. In the US, only ~6% of all plastic waste gets recycled. This compares with a 50% recycling rate for paper, 37% for metals, and 22% for glass (according to the EPA). 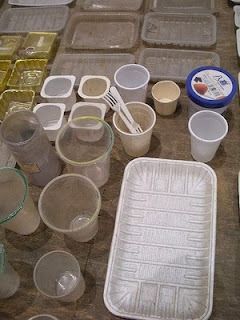 The low recycling rate for plastic containers is due to a range of factors, including: a) consumer confusion regarding which plastics (#1 – #7) can be recycled in their municipality, b) complexity in the process of sorting and processing each of the various types of plastic, and c) the unfavorable economics of processing certain types of plastic. Some plastics do have higher recycling rates (e.g., ~24% of water & soda bottles, plastic #1, are recycled each year), but most are unfortunately downcycled into other secondary products like textiles or plastic lumber (this again is unlike metals and glass which are often recycled back into new cans / bottles). Health concerns with BPA (in plastics #7 and #3). BPA is a common chemical used in the manufacture of plastic containers and to line some metal containers. It is found in baby bottles, water bottles, almost all canned food, soda cans. When these items are heated or cooled BPA can leech into foods and BPA has been found by some studies to be in the urine of 95% of Americans. BPA is a known endocrine disruptor and when in your body, it can mimic your hormones, eventually causing an imbalance. Several studies have linked BPA to medical problems, including breast and prostate cancer, thyroid disruption, obesity, heart disease, diabetes, asthma, hyperactivity, disruptions in fetal and infant brain development, and possibly miscarriages. Health concerns with styrene (in plastic #6), also known as polystyrene or Styrofoam.From the EPA – “Acute (short-term) exposure to styrene in humans results in mucous membrane and eye irritation, and gastrointestinal effects. Chronic (long-term) exposure to styrene in humans results in effects on the central nervous system (CNS), such as headache, fatigue, weakness, and depression, CSN dysfunction, hearing loss, and peripheral neuropathy… Human studies are inconclusive on the reproductive and developmental effects of styrene; several studies did not report an increase in developmental effects in women who worked in the plastics industry.” The EPA has also not released a formal classification of Styrene as a carcinogen, but studies have linked styrene exposure to increased risk of leukemia and lymphoma. Using renewable resources as opposed to relying on petroleum based products. The BP Oil Spill has finally been capped, but with it, we saw the “worst environmental disaster America has ever faced.” Much finger pointing and blame gaming has taken place, but the most compelling piece of blame I’ve seen has been written about in the NYT, by Thomas Friedman, saying “The BP Oil Spill is My Fault”. Friedman quotes his friend Mark Mykleby in a letter to the editor written by Mark – “If we want to end our oil addiction, we, as citizens, need to pony up: bike to work, plant a garden, do something.” One of the major focuses of our country (and the planet for that matter) is on lessening our dependence on oil… and one of the simplest things we can do is to step up and stop using petroleum based plastic containers. Increasing demand for composting access & curbside composting programs. There are ~3,400 composting facilities across the US, but unfortunately some research asserts less than 5% of U.S. communities have direct access to composting. We need to drive demand for more commercial composting facilities, for more curbside composting programs, and for increased diversion of food waste and compostable food packaging from landfills by municipalities. This can only be done if more people and businesses are using compostable containers and growing demand. Prices on compostables are coming down. Traditionally, plastic containers and lids have been cheaper than most compostable options, but this is becoming less and less true. While Styrofoam (or plastic #6) is still the cheapest of all food packaging options, paper based compostable food containers has been found to be comparable in price to plastic food containers (download PDF file from City of Richmond). Containers and products made from bio-plastics such as PLA do tend to still be more expensive than plastic containers, but prices are coming down dramatically each year as production capacity increases, and other alternatives, such as group purchasing organizations(like us :-)) exist to helps businesses move to compostables at a more affordable rate. Are you a consumer who has stopped using plastic containers or perhaps a business owner who’s now purchasing compostables? What made you switch?